Thanks for the Day Off! 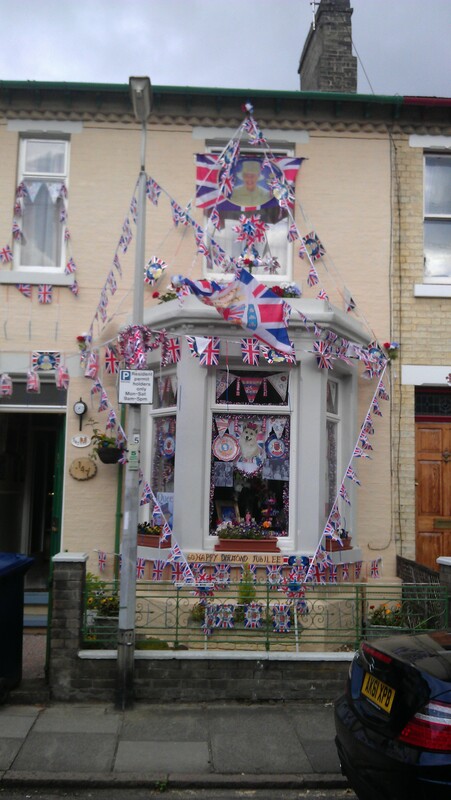 It celebrates the Queen’s 60 year reign (the Diamond Jubilee, for those of you living outside the UK). The Jubilee is a serious deal: there is a flotilla of Jubilee boats on the Thames on Monday; Monday and Tuesday are national holidays, and (my coworker told me) even nappies have Union Jacks. There are Jubilee M&Ms, Jubilee cakes, and Jubilee bunting everywhere. The local Salvation Army shop has a giant window display of fake coronation jewels and the local antique shop has a purple rhinestone pillow with “MUMMY” embroidered across the top. My friend Robert bought an array of Diamond Jubilee Tea Towels from John Lewis and when he brought them out to show me at the pub, the bartender squealed with delight. which is what a mayor of milwaukee said when the city council told him to present the keys of the city to some snivelling royal. he said no way.